Like all faculty members, I had been assigned to take meals in one of the university’s eight halls, but it was only on the rare occasion that I visited Volta Hall High Table. The dining room was vast and tiered and quiet. Following the British academic arrangement, students sat at Low Table about four feet beneath the long high row where faculty sat facing them. I joined the members at High Table, without speaking, for we knew each other only casually, and there was no love lost or found between us. 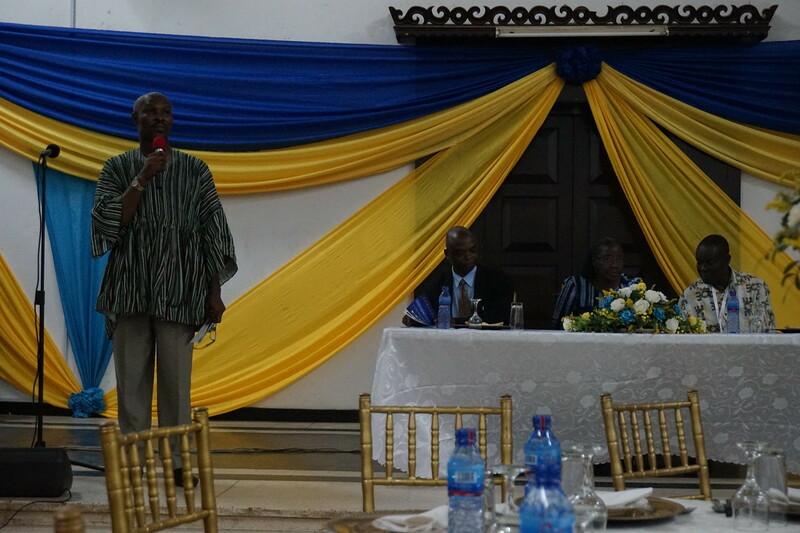 For our closing dinner of the ICADLA-4 conference, we had dinner in the Volta Hall dining hall. Volta is one of the older halls on campus and still all female. At the High Table tonight, the 2nd Lady of Ghana spoke, but quickly came down to eat and mingle with all of us down below!